Even more important than flashy graphics is incorporating an easy-to-navigate website. You don’t have much time to make an impression: did you know you have just about 10 to 20 seconds to impress your visitors before they decide to stay or leave? If they have trouble loading your page, it doesn’t display correctly, it doesn’t look professional, or it lacks clear navigation paths, they may simply leave and go to the competition which is the last thing you want. Your website design should contain a good combination of primary navigation options with drop-down menus along with secondary navigation options. This is called intuitive navigation. 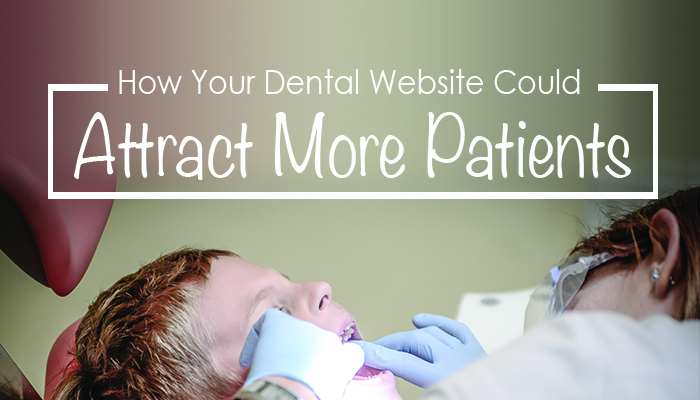 Dental websites designed to convert site visitors into patients. Any solid marketing plan should include social media as a way to connect to your followers in meaningful ways. It’s not rocket science to keep up with it but you do need to devote some time to building and fostering relationships with your patients. As the owner of a dental firm, you don’t have the time to do this, but your social media marketing manager does. Aim for posting daily or at least weekly to project a voice that people can relate to. This helps boost your relevance to both existing and prospective patients who may be on the fence about finding a new dentist. Attracting new patients means you have to be attentive, honest, genuine, and forthright in your posts to make them come to you. Increasing referrals while strengthening loyalty is the name of the game. Did you know that 50% of your patients should be originating from referrals? If you’re not currently experiencing this, you need to re-assess your approach, and loyalty programs are a great way to boost that number. The biggest roadblock to implementing a successful rewards program is advertising such programs. Do your current patients know they could earn gift cards, cash back and prizes for referring their friends and family? Add it into your newsletter, print it on their bills, and promote it on your social media feeds. It makes sense to utilize your current happy patients to bring in more business for you. It doesn’t cost you much and the potential for lifetime patients is exponential. Up and Social can help you attract new patients for your dental firm. Just give us a call today to get started. We are a small business digital marketing firm dedicated to customizing solutions for your company!